Happy St. Patrick's Day to you Alina! Have a terrific day! Wow...so beautiful...thankyou Alina..hugs and sparkles! Happy St.P's to you and yours! What a beautiful poem form days of old! Thank you for the bliss, Alina! 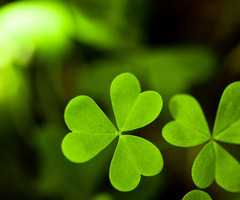 Happy Shamrock's Day to you, dear friend. May your day shine brightly! May life become more magical for you and filled with love! This is just a little message to say thank you for your message at my place. Hi Alina..wishing you a beautiful day and happy Spring Equinox and many blessings to fill your heart, your home,your family..and your journey all season long!Thanks for being a wonderful bloggy friend and sister! Thankyou for the beautiful comments on my art..it means so much to me! thankyou!